The registrations for Talent Hunt Hackathon 2017 - 2018 are now officially open. Online registrations are only for students of IT - Computers - Software (BSc / Engineering / Diploma / Masters ). No Online Registrations for School & Jr.College Level Participants and those willing to are requested to contact their respected Schools Principal. Read All The Hackathon Tabs In Top Menu of Our Site To Make Yourself Familiar With Requirements and Rules For The Hackathon Before Filling Out Registration Form. No Solo Participant Permitted in the Hackathon so you need team of atleast 2 or at most 4 members. Talent Hunt Hackathon 2017 - 2018 will be the First & Biggest Challenge Driven Hackathon in India till date. Starting on January- 08 - 2018, at Aspiration Academy Gorakhpur. Participants qualifying for the final round will be provided 72 hrs. to re-code their project which may be useful in real life scenarios. As the scale of this competition is unprecedented, we will focus only on making absolutely necessary facilities. 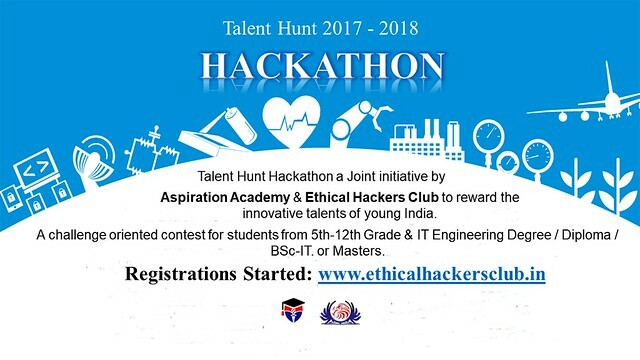 Participants are expected to co-operate with the coordinators, with the aim to boost talent in India Ethical Hackers Club is proud to host India's biggest talent hunt Hackathon organized by Aspiration Academy, Gorakhpur. India is the treasure of knowledge & Intelligence and Aspiration Academy believes in paying rewards to the growing young talents of India. Aspiration Academy creates the platform to make India the center of Supreme Knowledge. We not only dream of digital India but the Intelligent digital India with the best quality of Knowledge, Education & Life for our fellow Indians. The prime objective of this Talent Hunt Hackathon 2017 -2018 initiative is to create a permanent platform to harvest & praise the creativity and energy of our youngsters. We expect that all the participating teams will support us in this mega-endeavor and together we will cherish great memories. Do read all the pages of Hackathon to know more about Accommodations at the center, Rules & Other faqs. We make it very clear that organizers or sponsors are in no way responsible for any refunds for travel expenses for any team or team member. Participants are solely responsible for reaching the venue one days prior to the event and complete the registration process. (If any participant is to reach before the date as described above needs to inform the organizers in advance so that they can make appropriate arrangements). Teams will be provided with accommodation in the college hostel, Halls, and where required Classrooms will be evacuated to create space for participants to stay with basic facilities. No separate accommodation will be provided to Mentors if any and they need to stay along with the team members. Separate accommodation will be provided for boys and girls. Accommodation will be provided only to the participants any person accompanying the participants then they need to find their own accommodation (Organizers will not be able to help them). Accommodation will be available only for the week of the contest since 1 day prior to the event, anyone coming before that needs to inform organizers in advance. Breakfast, lunch, and dinner will be provided by the organizers. Team Members should bring their own Laptops with pre-installed all the required technology stack/tools. Only 4 laptops per team will be allowed during the competition. All team members need to sign an undertaking stating that they will abide by licensing terms and conditions of the tools/software they use, During the registration process. Organizers will not be liable/responsible for any violation of any licensing terms of software/hardware by participating teams or team members. As too many computers will be present during the competition team members will solely be responsible for carrying the internet connection as per requirement by their specific project. The team needs to bring any additional hardware if required for demonstrating the project. Organizers will not bear the cost of any hardware. Any additional cables, switches to create team specific network need to be brought by the participants. Come as prepared as possible and avoid dependencies on host organization. We aim to keep it easy for participants so the basic requirement for dress code will be in general A Plain T-shirt (with collar) & a Jeans (Team Specific Dress Codes Will be permitted but it should be in general criteria of T-Shirt with collar). The Contest is open only to students so each participant is required to carry their college ID & Gov. Issued ID- Card (Submitted in the registration form) handy. Any Participant without the listed ID will not be permitted to participate. Teams are allowed to bring half-baked or raw code for the competition. Teams can also get wire-frame ready for UI that will help them build product easily during the hackathon. Based on the suggestions during the competition, teams need to further modify their code and make their solution robust. All team members are expected to code during Hackathon and teams/members found roaming or not working will be immediately disqualified. The decision of organizers in this regard will be final. No TA or certificate of participation will be given to the disqualified team and will be asked to vacate premises immediately. If you have any major questions, please write to bhairav.bose@secrettosuccess.in. Please remember, we are getting a large number of emails, hence there will be a delay in our response. So only send an email if you really have any serious query.